It’s been said marriages are made in heaven and executed on earth. The world has borne witness to and heard many love stories. Some get lost due to worldly barriers but some turn into lovely weddings. True love does not need certification from the third person and decides their faith through consultation and faith between the partners. Love also ignores caste, religion, status and age barriers and finds the path to glory. Bollywood doesn’t lag behind when it comes to showing solidarity to these beliefs. These couples have clearly proven that age is just a number when your love is true! The hottest couple in town, PC and the ex Jonas Brothers band member have been fuelling rumours of them dating for quite a while now. However, they set the records straight when the actress stepped out of a suburban restaurant hand in hand with the singer and have now jetted off for a family trip to Goa. 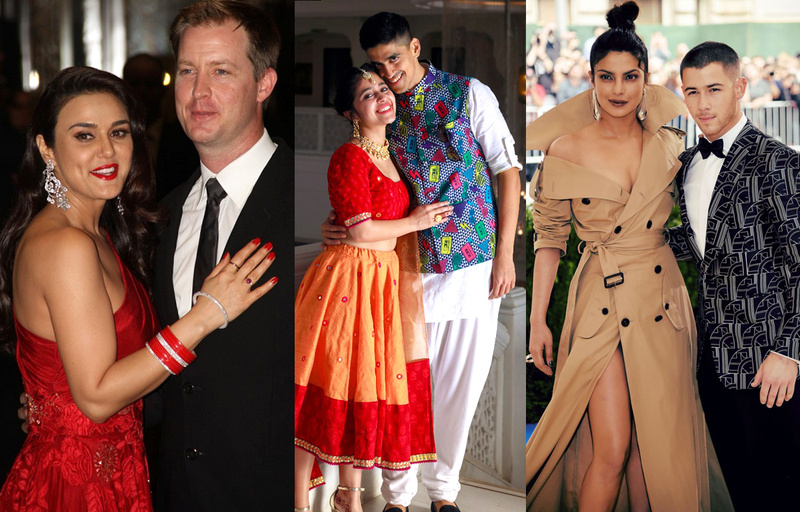 Nick, who is 10 years younger than Priyanka, has been smitten with the actress as is clearly visible from the cute comments he leaves on her Instagram posts. Angad Bedi who will soon be seen in the Sandeep Singh biopic, Soorma, got married to Neha Dhupia in a very private ceremony, shocking everyone in the process. The two, who were dating for a while before tying the knot, sure didn’t the age gap deter them. Haramkhor actress Shweta Tripathi has been crazy in love with Chaitanya Sharma, aka Slow Cheeta, who will soon be seen in Zoya Akhtar’s Gully Boys. The couple, who are all set to tie the knot in Goa end of June, have been dating for the past 5 years, despite having an age difference of 5 years. The dusky beauty and the TV heartthrob couldn’t get cuter with their Instagram PDA. The two, who started dating each other while filming for their film Alone, back in 2015, got married soon after and have stayed strong through all the split rumours doing the rounds for the past 3 years. Their age difference certainly holds no power as they couldn’t be more in love. Urmila Matondkar, who has been laying low for quite some time, also sent shock waves across the industry when she announced that she had married Kashmiri businessman and model, Mohsin Akhtar Mir. The cute couple are super into each other, given their Instagram posts and certainly don’t let age come in the way of their happiness. Preity Zinta found the love of her life in Gene Goodenough. Gene works as the Senior Vice President of a US-based hydroelectric power company. Though Gene is much younger than Preity, it definitely hasn’t held them back from tying the knot in 2016. Soha and Kunal were dating for the longest time before they decided to tie the knot in 2015. The two also became parents to their gorgeous daughter Inaya Naumi Khemu, 2 years ago. Shamita Shetty gifts herself a luxury car !